All of the Menus App’s features are accessible from one screen. Menus grace the page taking up most of the screen real estate. The top calendar bar allows users to flick the week left and right to view future time periods. Meanwhile the meal time buttons, the floating list button, and the icon button in the upper right give users the ability to make changes with a few simple taps. There are several ways to change the restaurant currently displayed. 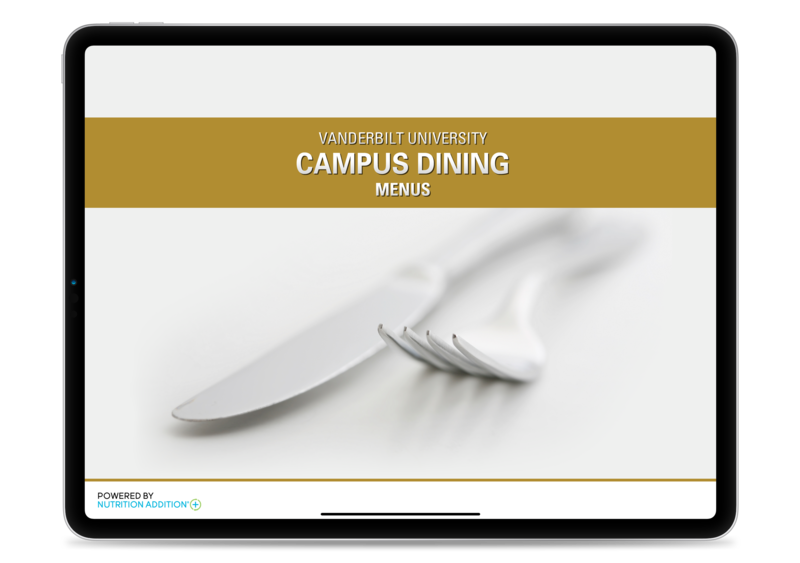 Users can tap the floating list button in the lower left to bring up list of all of the restaurants within your dining program. Additionally, you have the ability to organize these restaurants by physical location or by common theme. Users can also tap the restaurant name to bring up the list. Plus, a simple flick left and right will show the next or previous restaurant’s menu. You have the ability to designate any food with dietary icons to better communicate with your customer. And customers have the ability to show or hide any of the icons on the screen. This will help them be better informed or will assist in decluttering the menu screen. Dietary icons include Vegetarian, Vegan, Gluten Free, Organic, Kosher, and Halal. Allergy icons include Milk, Egg, Peanut, Treenut, Fish, Shellfish, Soy, and Wheat. More icons are available with the Additional Custom Icons extension. Integrate nutrition information directly into your menus! Clients who utilize the Nutrition Calculator can incorporate nutrition data into the Menus App and help inform customers about the menu selections they are making. After connecting Nutrition Calculator foods to Menu Manager menu items, users will see the same nutrition label that is presented with the Nutrition App. Each food with nutrition information is underlined, and a simple tap brings up the label. 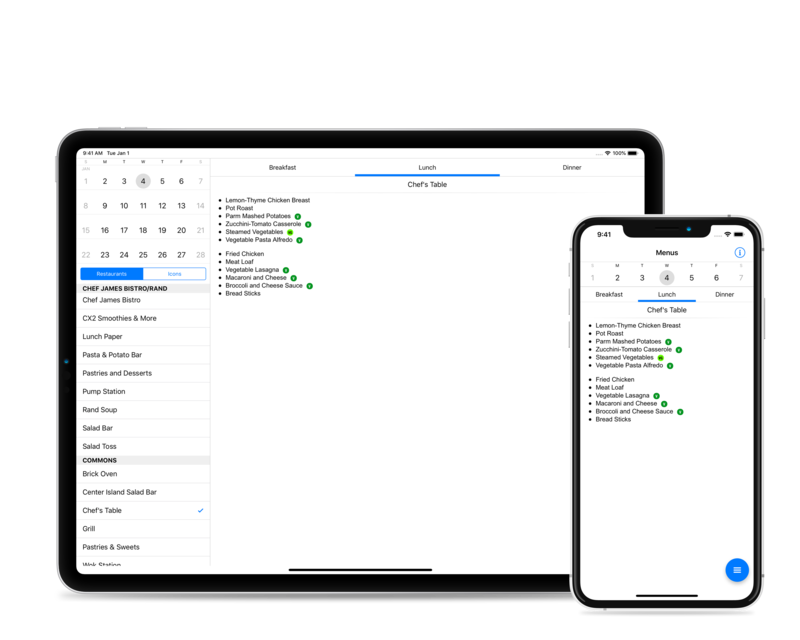 The Menus App allows you to customize a variety of areas within the app including the accent color (depicted as blue in the iOS screenshots), app icon, launch screen, the “restaurant” word (i.e., serving line, stations, dining halls), and the number of weeks visible in the calendar.